Upland ecology is predominantly rainfed and drought prone having nutrient-poor, well-drained, acidic soils. Direct-seeded rice (Oryza sativa L.) is the major crop beside maize (Zea mays L.), pulses and oilseeds in this ecology. Small portion of uplands with assured irrigation is also grown with vegetables. Nearly one-sixth of world’s rice land is under uplands (about 20 million ha) of which (upland rice area) almost two-thirds is in Asia (IRRI 1975; Gupta and O’Toole 1986). Upland farmers, particularly in Asia, are generally resource poor having small land holdings, and majority of them practice subsistence farming. Despite its (uplands) disadvantaged natural conditions for field crops leading to poor productivity, soil microbial health is comparatively less disturbed due to minimum use of modern agrochemicals. This makes the ecology suitable for manipulating beneficial soil microbial resources in favour of crop production. Poor phosphorus (P) acquisition by crops is one major constraint of this ecology. 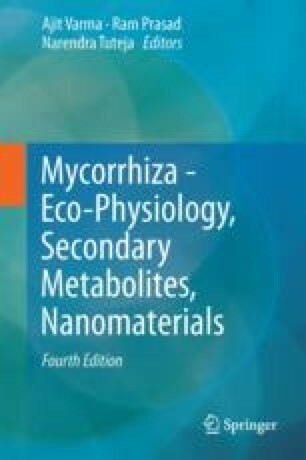 On the other hand, the aerobic soil conditions support arbuscular mycorrhizal (AM) activities which are known to facilitate P acquisition in associated plants. The present article deals with avenues of harnessing ecosystem services rendered by AM fungi (AMF) for improving P nutrition of upland rice under rice-based cropping systems.